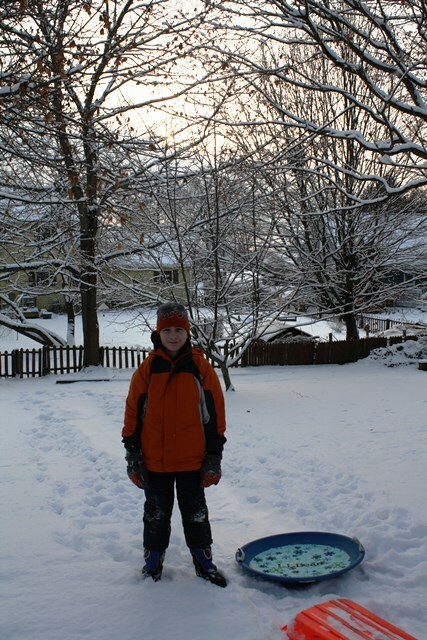 Sledding in our backyard is always a hit! I’ve experienced both extremes, and now that I’m a “work-from-home” parent, I think we’re in another category altogether! I’d like to enjoy this unexpected gift of time with my children, but snow days or not, my freelance work piles up on my desk and the emails continue to gather in my in-box. It’s hard to strike a balance, but I feel as though my family takes priority and I can work extra-hard, nose to the grindstone, to make up for it tomorrow (assuming school reopens)! Let the kids sleep in! Make a special breakfast or brunch together–pancakes, waffles, etc. Add chocolate chips! Have fun outside–build a snowman, go sledding, have an epic snowball battle, etc. If your creative juices are really flowing, create a snow sculpture. Bring the snow in: Cut paper snowflakes and decorate the house. If the roads are cleared, visit a ski resort for a day of fun on the mountain. Click here for our blogger Mary Ann’s tips. Make the official beverage of snow days: hot chocolate with marshmallows. If you chopped and froze your Halloween candy, sprinkle some atop the mugs! Click here for our previous post on this. Or, make a big pot of tea. Add honey and lemon… or add milk. But not lemon AND milk. Gack. Snuggle up and watch a favorite movie together. Add popcorn! Read a pile of books together (if you have elementary school aged children), or camp out in the family room, for separate but “together” reading time. Add blankets and a cozy fire in the fireplace. Be active… indoors! Rediscover your ping pong table, foozeball, or Wii sports games. Catch up on homework, school projects, music practice, etc. Enjoy “study time” together. Look at family photo albums together. Enlist the kids’ help to organize family photos on the computer, even putting together a movie featuring favorite photos using Windows Movie Maker. Look through last summer’s beach vacation photos and create scrapbook pages together–either by hand or online. Click here for a previous post, with lots of inspiration for beach scrapbooks. Summer dreaming: Brainstorm and identify potential summer vacation plans. Do some online research together to find fun summer travel ideas, beach rental houses, etc. Click here for our previous post on family vacation tips. Plan an indoor scavenger hunt. Baking! Whether you create cookies or cupcakes together, baking warms up the house as well as your tummies. Click here for our easy PB Chocolate Chippers recipe–only 5 ingredients! Make an extra batch of goodies to deliver to neighbors and/or package and freeze them to add a homemade touch to school lunch boxes. Have fun discovering entertaining YouTube clips together. Organize! Tackle a home organization project together–clean out one of the kids’ drawers, closet shelves or bookshelves. Bag up outgrown clothes, toys or books to donate to another family. Do some birthday party planning for the next family member’s birthday. Create invitations, by hand or online. Consider planning a “pie party” and make a list of all the delicious pies you’d like to make, tracking down all the recipes. Click here for our blogger Ruth’s tips on hosting a pie party. Play a marathon game of Monopoly! Pull out a variety of board games and play the afternoon away. Pledge to unplug and stash all devices away for the afternoon. Be artistic. Have fun creating with paints, origami paper, beads, or other art supplies. Sharpen your pencils and write poems about the snow. Post them on your refrigerator or bind them together for a keepsake. Make an ice “sun catcher.” Click here to see our post, with directions. Tackle a huge puzzle together! Put fun music on while you piece it together. Invite neighborhood friends over for a fun play day. Plan your summer garden with the kids’ input. Go online and order all the seeds. Make a big pot of soup together. Click here for a delicious homemade version of Tomato Rice Soup–especially yummy if you have canned or frozen tomatoes on hand from your summer garden. Pamper your pet. Work together to brush/comb your dog or cat. Wash their bedding/blankets, and scrub their pet food dishes. Whip up a batch of homemade dog biscuits in the oven. Take pictures of your pets. Take turns taking the dog out to do his business in the snow, LOL. Family talent show! Put on your favorite music, and dance… or sing your hearts out. Still have Christmas cards laying around? Click here for one of our most popular posts ever–a fun art project that “recycles” Christmas cards. Once the snow stops, head outside to shovel or use the snow blower to clear all walkways and driveways together. Lend a hand to your neighbors (and tap into your kids’ energy) by shoveling their walks too. If you’ve been outside playing or shoveling, chances are you’ll all be ready for an early bedtime. Pull out your bubble bath soaps and let a few family members indulge in warm, sudsy bubble baths before bedtime. Spa day! If your household contains girls, treat each other to manicures and/or pedicures at home. Heartfelt activities: If Valentine’s Day is approaching, get a jump start on your children’s valentines for school exchanges. If your children are older, create home-made valentines for grandparents, friends or other special people in their lives. If you have high school aged kids, it’s the perfect day to begin researching college decisions: potential majors and potential college choices. Bookmark favorite college and career websites on your computer. Have apples on hand? Slice them up for a healthy snack and whip up our recipe for Peanut Butter Dip–click here for the recipe. This idea may not win you “Mother-of-the-Year,” but enlist everyone’s help to catch up on laundry. Have everyone sort their laundry and let the sudsy marathon begin! Plan a family treat to celebrate, once the last piece of clothing is clean. Assuming you’re wearing snow boots if you’re going outside, no one will need to wear their sneakers today. Gather all stinky sneakers and clean them, running a few pair through the washing machine at a time. Sit them by the fireplace or by a heater vent to dry. Whew! Get crafty with magazines. Rescue a stack of magazines from the recycle bin and create some artwork together. Younger children can create montages of favorite photos they find, while tweens and teens can create posters filled with inspirational words cut from the pages. Pick up the phone and call a relative or family friend who lives far away. Put the phone on “speaker” mode so the whole family can enjoy the conversation. Or, use Skype! Retell your favorite family stories. Roll a video camera to capture the juicy details! Ask each family member to plan an upcoming family dinner menu. Whether using tried and true family recipes or brand-new recipes, have each person make a list of groceries needed. Your next trip to the grocery store is planned! Click here for our blogger Jen’s awesome recipe for Chicken A L’Orange. Play vacuum cleaner tag. Have each family member vacuum one room of the house, then “tagging” the next person with the vacuum cleaner to clean another room. By the end of the game, the floors are clean. Mops work too! Have a treat in mind for everyone to enjoy when the last room is completed. It could be the family movie idea (#9) or reading time (#10)… not necessarily an edible treat. Look through your school yearbooks together–yes, your yearbooks as well as your kids’ yearbooks. Thank me later for all the laughs you’ll have. Create a playlist of your family’s favorite songs on Spotify. Or, have each family member create their own “top 10” list of favorite tunes. Hug often. Today is a gift. And now that I’ve made this list… we probably won’t have another snow day all winter. Oh well, I’ll be ahead of the game for next winter! What are your favorite ways to spend snow days? Add your ideas by commenting below! Great list! Dave and I talked about the snow day dilemma just last week as we both are able to work from home–delicate balance. Thanks, Jen! Yes, you have a double-whammy with both of you working from home on snow days. I’m sure that’s an incredible challenge! Ah – so we DID indeed have another “snow day” this Tuesday, January 21st! My 4 year old and I used #1, 3, and 50! 🙂 Thank you for such a wonderful long list of super-fun ideas!